With an unusual grandstanding and harsh words, the Nigerian military today warned political office holders and civil servants that the nation’s armed forces are already running out of patience with the manner things are going in the country especially the unbridled looting of public funds and undue interference in the runnings of military operations. Chief of Defence Staff (CDS), Admiral Ola Sa’ad Ibrahim and the Chief of Army Staff, Lt.Gen. Azubuike Ihejirika issued the threats separately today though in a manner that suggests that their decision to make the declaration was predetermined and coordinated. They both spoke in their offices in Abuja while receiving the new Permanent Secretary posted to the Ministry of Defence, Aliyu Ismaila. The CDS who fired the first shot at the Defence Headquarters (DHQ) categorically declared that the military was fast running out of patience with the “pile of mess” being created in the polity as reflected in the runnings of the Ministry of Defence. “You find too many stories about grandstanding, stories about procurement. I hope your tour of duty will focus on these issues. I will close this my response by saying that you inherited a pile of work, let me call it work, some call it pile of mess. You have to clear it up”, the CDS warned while referring to the corruption rooted in the MOD. 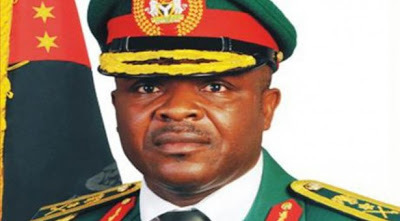 Also speaking in the same tone, the Chief of Army Staff (COAS), Lieutenant General Azubuike Ihejirika warned that the military have had enough from political office holders in the MOD interfering in their operational issues. He condemned the practice where civilians in the ministry preside over the procurement of military logistics and operations vehicles amongst others without the involvement of relevant service chiefs. The North should forget the Presidency in 2015. The 39 years of North reign of Nigeria’s 52 years of independence, representing 75 % of space of rulership is yet to be rivalled by any other section of the country. There is a section the Igbo that has never tested the highest office in the Land. Even if Jonathan decides not to run, the chance should be given to the igbos. Is the game of number in idle situation, so please be patient!! Ambrose,u are talking nonsense.who is talking about north wants to rule.you didn’t think first before you voted for GEJ.if the have chance to rule this nigeria,they will rule it.which party in this country that have opportunity for the igbos axcept CPC or APC now.wen Gen Buhari took Okadibo as running mate which could have open the chance for igbo to run for president,you igbos voted for OBJ n PDP.so wat are excusing the north.I will also support d military to take over.Gen Buhari said it and its happening.furthermore,nigeria is not a poor country.our leaders n elites made nigeria to b a poor country.So ikonjo shoud stop lying to d world that nigeria is a poor country.has she forgotten about the fuel subsidy n oll d fake contracts awarded.pls soldiers take over welda north,north central,north east,south,east,south south n south west who d cap fit in d military to take over let dem do so.no job,no nepa,no freedom n cost of living is vry high. i use to be surprised most of the time i read the comments of supposedly learned nigerians most especially youths as touching national issue and this suggest to me that our educational system has never changed us for better in any way we are still as backward as colonial era. what we need in this country is good goverance insrepective which region of this country produces him. as long as we are still thinking this way we will never come out of this mess. The North uses the military to take power any time they feel marginalised. That’s what they are trying to do this time. I am not happy the way this. Nation is running by good luck. No light nothing is working , is solder want coming back . I support them. These people are theft. Democracy is supposed to be centred on the people. In Nigeria? No! nigerian politicians can never in their lives learn from the past mistakes of their predisuccesors in the first and second republic.it will be better for the millitary to take powers. . Which chance? So becos igbos have never ruled it should jst be given to them on a platter of gold? It is nobodys birthright. If igbos want the presidency they should mobilise and prepare themselves and choose a credible candidate that nigerians will vote for. Enuff of we hav never ruled abegi! There’s no need to shout in this country. We only need revolution to solve this country problem simple arithmetic. Revolution and handover to who?… tinubu? Weda north or south,we all bear d grive..y can’t it be a youth lik me and u since our fathers have failed us…who d cap fits,shud wear it and lets 4get dis tribal&ethnic discrimination and be rationale 4 once. If the politicians can’t stop looting Nigeria money the militry should take over from them. We all know things are bed in Nigeria,matter of fact its a worst case senario we are faced with. No jobs,healthcare sectors is virtually at ground zero,no social amenities, basically the economy is in a state of comatose and only the super rich seem to be smiling. But what we should all have at the back of our minds is that, the worst civilian regime is still far better compared to the best military regime/govt. Things are not working should not make us start wishing and praying for a military takeover of govt. Its like a parents throwing there child away on the grounds that he can’t work. The change we seek in nigeria lies with we the youths, we must forego ethnicity and tribalism if we as a country must grow. Zoning of the seat of power,and other vises must be done away with. Its hard time we start to consider the right man for the job rather than its turn of either the igbos,housa or yoruba. Nigeria is made up of over 300 ethnic groups! We should do away with indigeneship and start seeing ourselves as “NIGERIAS” one people and nation. Our major problems aside corruption is that of how we think and reason as a people… We need a revolution yes! But it should be that of our MIND. God save and Bless niaja. Try and understand a post before u comment…d military did not say it is taking over…They are simply not happy on how the politicians sent to the ministry of defence are handling issues of logistics and procurement…they are simply sounding a note of warning to another politician sent to them to either sit up or watch them take over the management of their own affairs…Nigerians! Learn to read and understand. Don’t allow sentiments take away your comprehension ability! The Fear Of God Is The Begining Of Wisdom. Things Will Continue In A Zig Zag Way If We Still Refuse To Recognize The Maker Of The Whole Universe. In The Time Of Noal, God Wipe The Whole Earth Due To Attrocities & Keeping God Aside, In This Our Era, It Is FIRE. Anyone Be It Military Or Civilian Cant Rule A Nation Without Genueinly Fear God. Either Old Or Young, What Happen To Bankole? He Was A Youth But Fall D Pipu Hands Too. Money Matter. Bible Says The Love Of Money Is The Root Of All Evil. It Is Not By Power Nor By Might, But By My Spirit Says The Lord. Lets Fear God All. Tankz@ charles. Nigerian youths! See and think, b4 u comment. Na simple mata cause all dis grama. Na wa ooo. you Nigerian Military are part of the problem not solution! Wa suffer alot from previous coups and juntas, and we don’t think you will be different from the others. Your duty is to protect our boarders from outside attack not to put your nose into domestic politics! Some people are just naturally dumb. If u cant read and understand a question, how do u intend to answer correctly. Despite the corrections make above, some ignorant fools still go ahead and run their mouth like say their brain de on 3G, whereas they had d sign of SOS. Please lets reason before we post. What are they saying, what are u commenting about. And these are majorly youths. Where is the future in Nigeria? I TOO GIVE MY SUPPORT FOR THE MILITARY RULE TO TO TAKE OVER AGAIN. The most rulership space in this country was occupied by the military & they had nothing to show for it than taking Nigeria backwards. They only want there own share of the Nigerian money & when they come they will always take the lion share bcos they have guns. The worst civilian administration has always been better than the best military administration. Do not clamore for their return. Barclays is to EPL what Globacom is to NPFL: Globacom Signs Premier League Sponsorship Deal.